Why, hello there. What’s a nice insert-gender-here like you doing in a place like this? Dude, what isn’t in my handbag? I don’t have a handbag, I have a life-support system with a shoulder strap, heavy enough to knock out a gorilla if I swing it hard enough. Don’t ask how I know that. I think that’s all of it. Yes, it’s a lot, but now that the kids are both out of diapers, this plus a juice box or two pretty much has me covered when we go out. My husband makes fun of all of my stuff (and the fact that I can pull pretty much anything out of here, like Mary Poppins’ carpet bag), but he’s never complained when I had something he needed! This entry was posted on Monday, July 8th, 2013 at 8:00 am	and posted in 31 Day Blog Challenge. You can follow any responses to this entry through the RSS 2.0 feed. I don’t have a handbag. Wow. 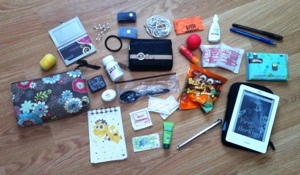 That is so like what’s in my purse. It’s scary. Except my notebook has butterflies on it. I don’t have the tire pressure gauge though. Need one of those. Could use some peanut packets.